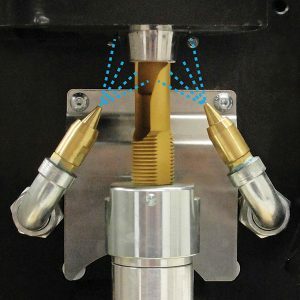 Torch Wizard® Nozzle Cleaning Stations assist in maintaining quality and productivity in MIG welding cells by quickly and efficiently removing spatter build-up in the gas nozzle. Anti-spatter is applied evenly through two spray jets, allowing for simultaneous reaming & spraying – reducing cycle time by up to 50%! All stations feature a two year warranty with exclusive use of Blue Magic® / Blue Chill® anti-spatter. Made in USA. 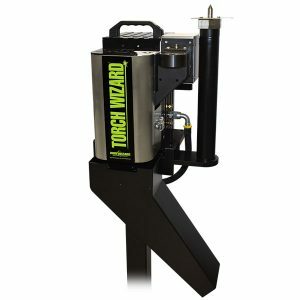 Torch Wizard® Automatic Robotic Nozzle Cleaning Stations assist in maintaining quality and productivity in your MIG welding cell by quickly and efficiently removing spatter build-up in the gas nozzle. Anti-spatter is applied evenly through two spray jets, allowing for simultaneous reaming & spraying – reducing cycle time by up to 50%! Two year warranty with exclusive use of Blue Magic® / Blue Chill® anti-spatter. 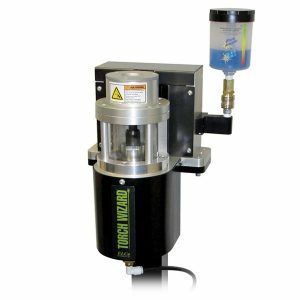 The new Torch Wizard® Self-Cleaning Nozzle Cleaning Station is a low maintenance workhorse designed for high volume applications. The station features a self-cleaning air blast to clean spatter and other debris from the blade and air motor. 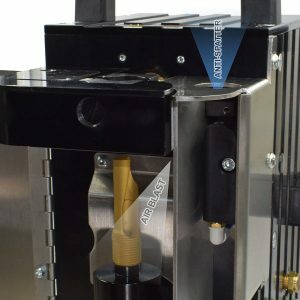 Anti-spatter is applied evenly to the nozzle and tip through an isolated compartment, eliminating wet debris build-up on the reamer blade and motor. Two year warranty with use of Blue Magic® / Blue Chill® anti-spatter. 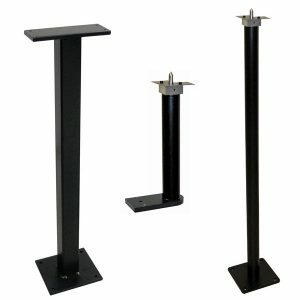 Tool center point adapter and evacuation chute shown in photo sold separately. 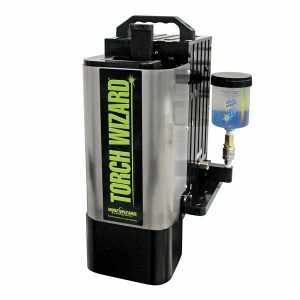 The Torch Wizard® AP Nozzle Cleaning Station features reliable all pneumatic operation, making setup and operation a breeze! Models are available to accommodate most popular torch nozzle sizes, and adjustable nozzle guides ensure consistent reaming every time. An enclosed operating environment with catch tray and drain keeps the weld cell clean. Optional stand features a caddy that holds a one gallon container for collection of used anti-spatter. Two year warranty with exclusive use of Blue Magic® / Blue Chill® anti-spatter. Requires AP style reamer blades. 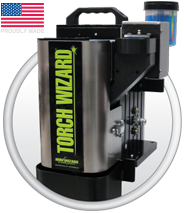 The Torch Wizard® TA Tandem Arc Nozzle Cleaning Station is specially designed for removing spatter build-up in tandem arc torches. Anti-Spatter is applied via the dual sprayers allowing reaming and spraying simultaneously for shorter cleaning cycles and higher part production. Two year warranty with use of Blue Magic® / Blue Chill® anti-spatter. Made from alloy tool steel and Titanium Nitride (TiN) plated for enhanced durability, Torch Wizard® Reamer Blades maintain their sharp cutting edge and resist breakage. 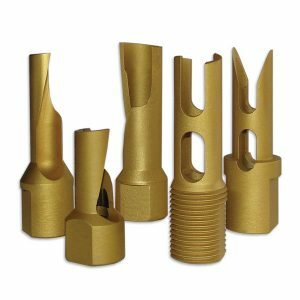 Sizes for all nozzle IDs & lengths available. Universal (male threaded) replacement blades also available for other major reaming station manufacturers. Made from alloy tool steel and Titanium Nitride (TiN) plated for enhanced durability, the cost effective Torch Wizard® Universal (male threaded) Replacement Reamer Blades maintain their sharp cutting edge and resist breakage. Sizes for all standard nozzle IDs & lengths available. Order female threaded blades for Torch Wizard® Cleaning Stations, these blades are designed for other cleaning station manufacturers. Three wire cutters models are available. All cutters feature a robust O-1 hardened steel blade for superior blade life. 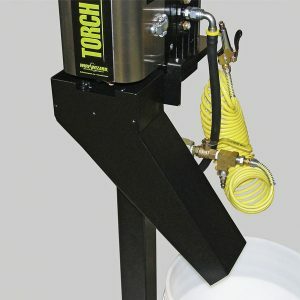 Integrated Wire Cutter – May be added to 7-pin or 9-pin Torch Wizard® Cleaning Stations sold without them. They are included on stations with a “C” in the part number, such as the EL-NCS-AC-16 or EL-NCS-ACD-16. Cuts Wire sizes .035 to .062. Standalone Wire Cutter – Portable wire cutter that operates on 80-100 psi shop air and 24v power. Cuts Wire sizes .035 to .062. 36 in. 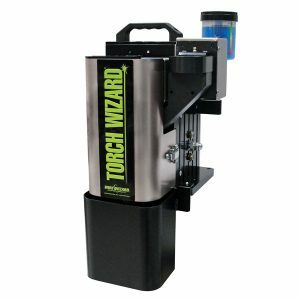 (914mm) stands available for Torch Wizard® Robotic Cleaning Stations and All Pneumatic (AP) Cleaning Stations. Custom heights available upon request. Check model numbers to ensure your are ordering the correct cable for your Torch Wizard® Cleaning Station. 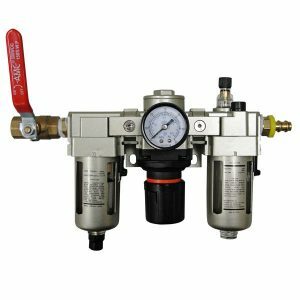 Filter/Regulator/Lubricator (FRL) unit for Torch Wizard® Nozzle Cleaning Stations. Compatible with all models. Includes elbow fittings for air line attachment. 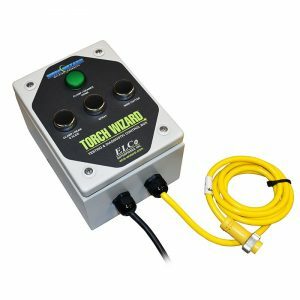 The Torch Wizard® Reaming Station Test Box is a recommended maintenance peripheral for periodically testing and fine tuning your reaming station. 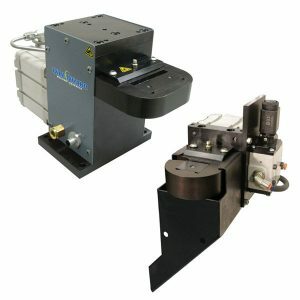 Functions include: Sink/Source, Motor Slide Up/Down, Nozzle Clamp, Anti-spatter Spray, Wire Cutter. 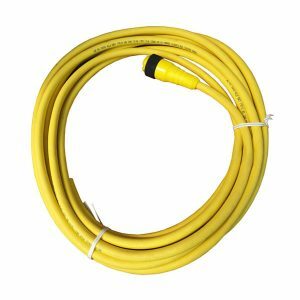 Includes 110v AC unit and a 5-pin or 7-pin cable.